I recently hosted a Megablok themed playdate. All 9 toddlers and their mommas had a great time playing. The day after our big Megablok playdate, I took a note from my favorite educational mommy blog, Teach Mama, and I spent some quality time playing alone with my 26 month old daughter using the Megablok toys as educational tools. I started by placing 1 megablok of each color in seperate tile squares on the patio. Then I would pick one out of the bucket of multicolored megabloks and ask my daughter to tell me the color and place the block in the appropriate square. Done! Then I asked her to pick the color that I called out from the bin of multicolored megabloks and place it with the appropriate square with the matching colored block. Slightly more difficult spin. We examined the megabloks from different angles and identified squares, circles, and rectangles. I placed a small and large megablok next to each other. Then I would pull a block out of the bin and ask her to tell me if that was a small block or a big block and place it with the other small or big blocks. 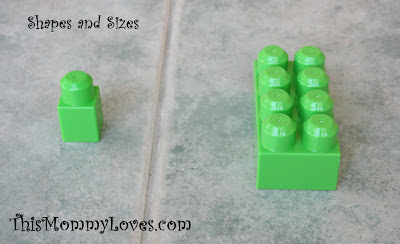 Once we mastered 2 sizes (small and big), we moved onto small, medium, and large. By the end, she would tell me "Momma, dis is a mejeeum one"
It's easy to run out of things to do with the little ones throughout the day so trying to take toys that you already have and using them in a new way helps to make the days go by and you can feel good knowing that you're teaching your kids in a fun way! 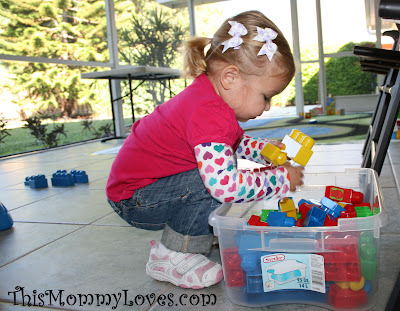 What are some of your favorite educational toys or activities to do with toddlers? Hey btw, I started my new ~~SPecial PArty~~ this week, **6 weeks 2 JINGLE** all things Christmas, so come check it out, participate, and check back often, it's sure to be full of fun projects.